Anchorage Civic Club's July 4th Celebration! Join your family and friends for the Anchorage Civic Club's Annual 4th of July Celebration! Fireworks over Owl Creek Country Club at dusk. Please take care of the golf course and park your vehicles appropriately. Kindly do not bring your own food, beverages or fireworks on the premises. Anchorage Firecracker Fourth t-shirts will be available to purchase for $10. They will be sold from 8:00-11:00 a.m. at the lower level of the Anchorage Cafe, and also at the community picnic. 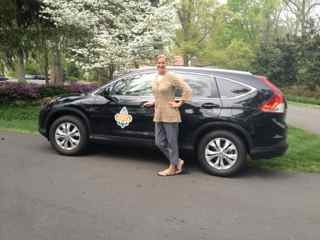 Got my Kentucky Derby Festival Car this past week from Bob Montgomery Honda and is it ever fun and cute! I want to encourage all of you to participate in as many Derby activities as you possibly can. And to all my home buyers who are new to Louisville, Kentucky may this Derby be your very best!